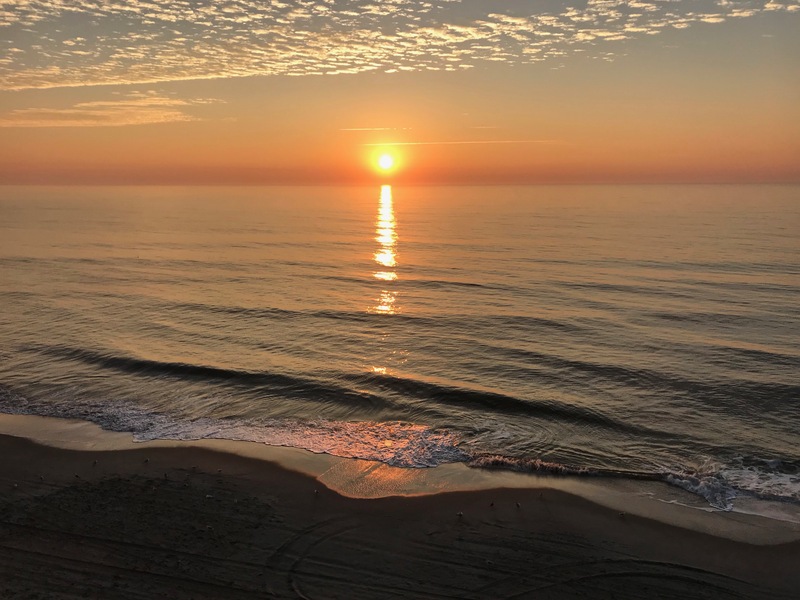 There have been some beautiful sunrises and sunsets, and we also enjoyed some amazing temperatures in the 70’s which allowed for outdoor adventures in short sleeves. So, what have I been doing on my break? Well, I’ve been fairly productive. I finished the two baby quilts I was working on and got them off to their respective destinations. Why gray in a baby quilt? Well, the Lattice quilt on the left is going to a baby that has a gray and white themed room. The Kelsey quilt on the right went to a Mom who spends a lot of time outdoors. I thought a fabric panel with animals might be a nice focal point and was able to use some of the same fabric because it went well with the panel colors. February is a big planning month for northern Master Gardeners. There’s a new Board, new projects, and a lot of online work to be done. I’m back on the Board as of this month and continue the duties of webmaster. That keeps me pretty busy all by itself. There’s also been a lot of socializing and just plain good times with friends. These snow birds like to have fun, and I try not to miss too many opportunities. With beautiful weather, there have also been some amazing days with friends at Brookgreen Gardens watching the gardens come to life and enjoying their current Birds in Art exhibits. 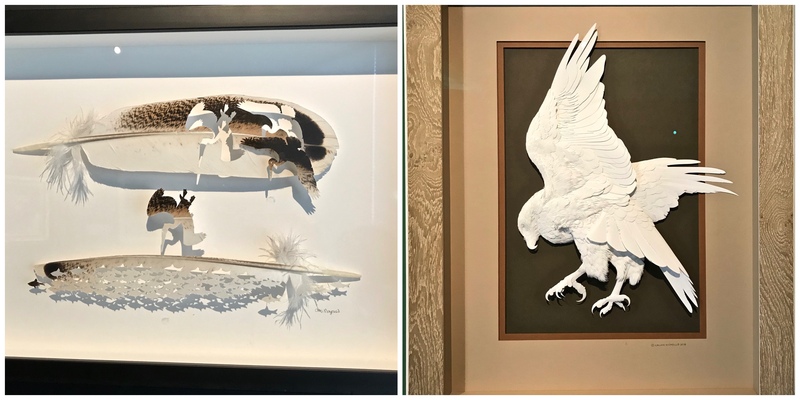 The art piece on the left is two feathers, and the right one is made out of white paper. Amazing. I’ve never lived thirteen minutes from a Botanical Garden that I can stop in with friends whenever we want. It’s pretty darn nice. 🙂 Another time, I’ll tell you about the behind the scenes tour we took and maybe a story about some buttons. This entry was posted in Gardening, Quilting and tagged Brookgreen Gardens, Friendship, Gardening, Life, Quilting, Seniors, Snow Birds, Socializing, Valentine's Day. Bookmark the permalink. I like the Lattice quilt, the way it brings old and modern together. I’ve never seen one like it– which is not to say that I don’t like your other quilts, btw. Living near a botanical garden would be a treat. Glad that you’re enjoying it. Beautiful quilts and bird art. It sounds like you are e having a great time escaping the cold! An amazing post, so much to see here. Especially loved the oil paintings. Thanks. 🙂 The artists displaying their talent at this exhibit is jaw dropping. I will probably go back again because one can never get too much of this type of beauty in life. OMG!!! Your first photo is just stunning! Yeah, perfect for a tourism pitch! LOVE the quilts. I am always blown away when I see pictures of your craftsmanship. The artwork is amazing, but the eagle created from white paper…..wow! Enjoy those warmer temperatures my friend. We’re in for 5″-8″ of snow/ice, and your hometown is expecting considerably more! 😡😡 So glad you won’t have to shovel it!! Stay well. Happy ❤️ Day. I’m sure you’ll manage to find something sweet to eat. Lol. Enjoy that card making class. This gets better and better! What a show it would be! But seriously – those baby quilts! Wow. Such subtle beauty. I really like how the quilting stitches are prominent, nicely complimenting the squares. The grandkids had eight (8!) “snow days” in the past 2 weeks. Mostly due to bitter cold, ice, and power outages. They’re back today, but more ice is expected tomorrow. Superintendents are besides themselves on how to make up the days, already adding Friday before Memorial weekend, and one more oddball Monday to end of June calendar. I’m worried that any more might bring a throng of Kindergartners to their doors with torches and pitchforks! So glad life has settled down! I have been thinking of you this past week or two. The quilts are very, very lovely. And what wonderful bird art. Being so close to a botanical garden must be a treat, and how great it must be to have a circle of friends who like to be active. Finally, that sunrise is fantastic. Now wonder the county wanted to use it. PS, I can see why they would want to use that photo! 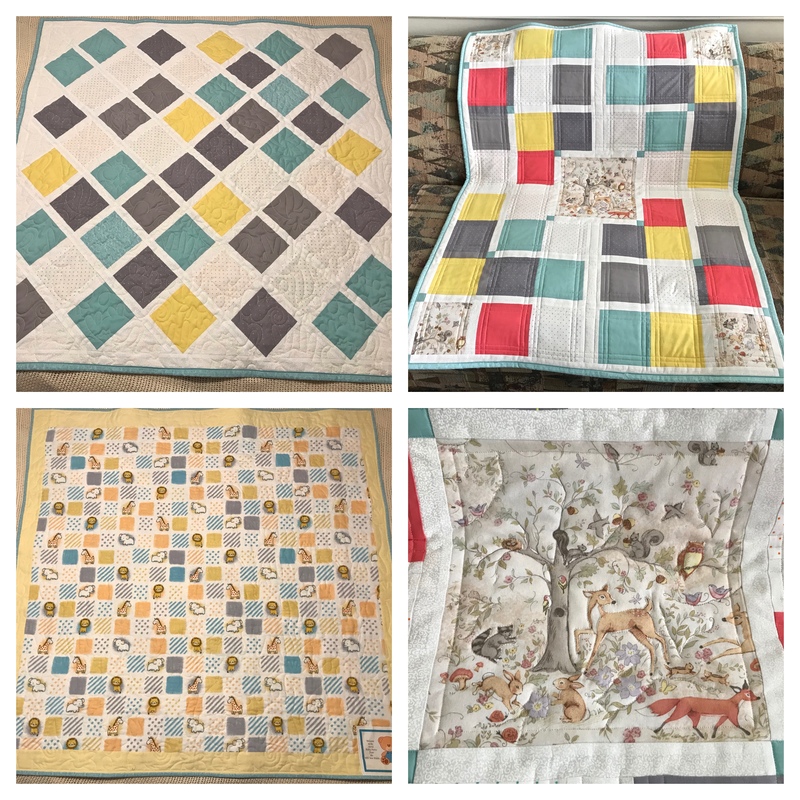 Lucky babies to receive such beautiful quilts. May they be cosy when covered with love. I really like the lattice quilt, but I adore the animal one. Oh my yes, that’s adorable. I went around without a coat for quite a bit yesterday (I think it was around 35) and the ease of movement was refreshing. Of course, eventually, I got cold and went back inside, but it was nice. I don’t even wear short sleeves to bed right now, so you enjoy your 70 degree stuff a bit for me! Glad things have leveled off Judy. Absolutely gorgeous ocean sunrise. I’m assuming sunrise cause you’re on the East coast? And, here, I was worried something bad had happened to take you away from us! It sounds like you’re having such a wonderful time, really living it up–good for you! We do try to take advantage of the good weather and all the nice folks down here. How exciting to have one of your images selected by the county!! WOOT!! The quilts are beautiful. Baby Girl has the same color scheme for our newest grandson’s room. I love the side with all the animals. GORGEOUS! I hope you had fun card making. I used to do a lot of that when I was in my rubber stamping phase, but haven’t broken out my stamps in a long long time. I’m curious now about the buttons and the behind the scenes tour. I hope you share those stories sometime. Sounds like you are having a great time. Beautiful work on the quilts – recipients will love them. The art of course captures my attention like no other, except your exquisite photograph! Congratulations, very cool! The sunset is a gorgeous photo. Now you can add Master Photographer to your other creative talents!! Quilt making fascinates me because of the vision you need to have to just imagine it! You have been BUSY! And have accomplished so much. I love the quilts…and the bird art exhibit would have been fun to see. And I LOVE your first shot…it is beautiful! Glad things are better and I welcome your posts… missed you! Beautiful quilts and the birds are lovely. Sounds like a wonderful time is being had! Ooooo that sunset photo is amazing. I do hope you got paid for your photo. As an artist, it’s important to be paid for your work. Such beautiful paintings and I was surprised to see the paper sculpture, it’s not as common. My dad was a paper sculpture artist so my eye detects those right away. I’ve also got a quilt going with gray in it but it’s dragging on forever… haha… I needed your inspiration to keep going!